This three bedroom house with a lovely green garden that measures 5160 sqm has been kept to a very high standard and because of the idilic garden, it feels like you are in your own personal paradise. On entering the house you are by a very large entrance hall. This hall leads to all the divisions of the house. In front there is the dining room, to the right the kitchen and to the left, the living room. In this space there is also a big built-in cupboard which gives more storage space. From the dining room, there is direct access to the kitchen, as well as a hatch. The kitchen is spacious and has a nice pair of patio doors which gives the kitchen lots of light. There is also a very generous amount of cupboard space. The patio doors lead out to a covered seating area. At the other end of the kitchen, there is a small corredour which leads to the main entrance hall and the laundry room. All of the three bedrooms are spacious. All have built-in wardrobes and the master bedroom has a large en-suite and air conditioning. The living room of the property is nice and spacious with two large windows, an open fire place and a large set of patio doors which lead out to a lovely porch area, perfect for wining and dining. The property benefits from double glazing through out and gas central heating. The garden of the property has a great variety of different trees, of which most are not native to Portugal. There is also a barbecue area and a garage. 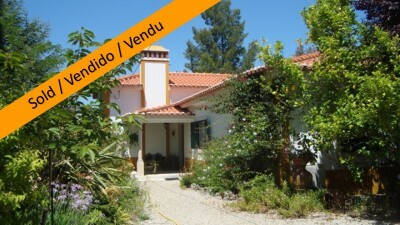 The house is situated near the village of Curvaceiros which has several cafes and a shop. The larger town of Tomar, which is around 10 minutes drive from the village, has a variety of supermarkets, shops, cafes, restaurants, agricultural merchants, a weekly market and bus and train stations. The closest airport to the property is located at Lisbon, which is around one and a quarter hours drive. Lisbon airport is serviced by a variety of low cost airlines, which operate regular flights in and out of the United Kingdom and other European countries.